Sometimes in business, your only option is to guess. When a decision must be made right now with limited information. Or when you’re trying out a new marketing technique. We suppose, figure, approximate on a daily basis. When it comes to your kilometers, however, guessing is not in your best interest. The problem with guessing isn’t that you’re never accurate, but that you could be grossly under-inflating or over-inflating the write off you claim on your vehicle for business use. How can this hurt you? Underestimate, and you’re missing out on a portion of your write off. Which means you’re paying more tax. When you overestimate, you run the risk of arousing the suspicions of the CRA and landing yourself a date with an auditor. Remember: by not keeping a kilometer log, you have no supporting documentation, which opens you up to penalties. Another disadvantage to inflating your write offs: it could potentially endanger your future dream home purchase. Kilometers are a mandatory part of writing off your vehicle. In case CRA ever questions you, they will want to see a copy of your kilometer log, or a way that you have reasonably accurately tracked your kilometers for business usage. Then you risk having 100% of this write off struck from your books. 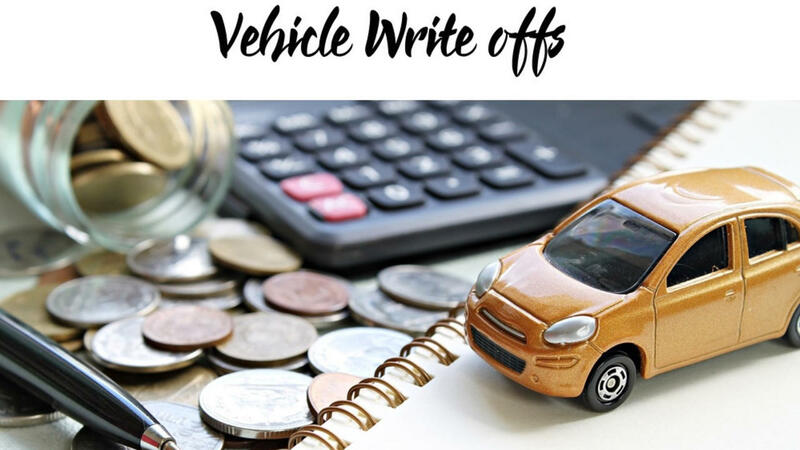 You actually have a couple of different choices for how you write off your vehicle (which we talk about later in this blog). If you want the most efficient way, you have to arm your accountant / tax preparer with the information they need to make an informed decision. Driving 5000 kms a month with a 2006 Dodge Ram is likely a vastly different decision that driving 1000 kms a month with a 2018 Honda Civic. So, how do I properly write off my vehicle? For sole proprietors, there’s really only one option, and that’s taking a percentage off your vehicle expenses. For incorporated businesses, writing off kilometers is one of two ways you can claim your vehicle. Pay yourself a fee per kilometer of travel. Distance, year, type of travel, type of business....it all makes a difference to maximizing this write off to your advantage. However, especially for incorporated entrepreneurs using the kilometer method, save the guessing for the Price is Right. If you want to really get detail on your particular situation, you could join the next LIVE workshop. Do yourself a favor and track those kilometers! Invest in an electronic tracker, or even an app, if the tried and true pen-and-paper system seems too tedious. My favorite one is MileIQ, you can get the discount code here on the "Tools" page. Have a system already? I’d love for you to share it with the other entrepreneurs in our Facebook group. Wait...have you been good? Well, you might catch a break! There is something called the "Simplified logbook". However, you have to be good for at least a year to take advantage of it. Once you get there, then "guessing" starts to become more realistic. You can read about it here on the Canada Revenue Agency site. Once you know your method, then keep the proper paperwork. Once you and your tax person have had a conversation about the best way to write off your vehicle, now you have to properly track the expenses. First.....know what you can and cannot write off. Second....keep only the expenses that you can write off. Keeping unnecessary expenses will only just increase your bookkeeping & accounting fees. If you are running two vehicles, I strongly recommend you keep track of what fuel is going into which vehicle. If you are ever audited, you will be thankful for this advice, and I think you will owe me a latte (Starbucks vanilla latte with soy, please). How about parking? Car washes? Yup. That is different also. I won't bore you with the details, because again...it is different with everyone...but make sure you pick this out and ask your tax person. TIP...ask them what you do with those "cash tokens" in the car washes. Every vehicle is different....a new vehicle means a new decision. Remember, if you purchase a new vehicle, then you should be talking to your tax person BEFORE you lay down the cash and sign the sale agreement. It may be in your business name, your personal name, a purchase, or a lease. I cannot stress enough that every situation is different. So, every vehicle is different. If you want to buy that shiny new truck, check in with your tax person and make sure that you can write it off in the best possible way! How do you keep a log? Well, there are technical rules, and then there are realistic rules, I say. Keep in mind that I can never guess what the CRA will determine, you have to have a reasonable record of the kilometers that you traveled for business purposes. I have seen a ton of different ways. Some have worked. Others haven't. Here are some of the creative ways I have seen people keep their books. I think they are reasonable. But I think it matters more what CRA things. If you can argue that it is reasonable, then you are half way there. Grab a small notebook and jot it down each time you travel. Use Outlook as your schedule. Put in every time you travel somewhere for business purposes. Track it beside your meeting. Google the distance later. Review the expenses you have. Each time you have an expense, it is a reasonable assumption you drove there. Record the kms from your office to destination. If you work out of town....record odometer on Monday AM, and then on Friday PM when you return. Use an app, such as Mile IQ (which is my personal favorite). Use discount code LGAG752A on their site to get 20% off a subscription fee. Pay your assistant to bug you daily about where you were, and make sure they are recording it for you. Want to know more about your vehicle write offs, write offs in general, or the essentials of business? Check out my courses here. Or do the LIVE WORKSHOP version of it to get real to your business. Stay safe on those roads and keep traveling toward greater success!